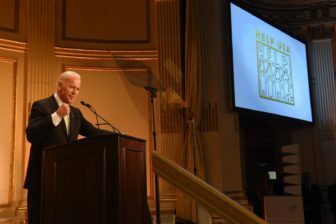 New York – HELP USA, a national homeless services non-profit with a large focus on serving survivors of domestic violence, honored Vice President Joe Biden and four other civic leaders at the organization’s annual Scholarship Awards Luncheon on Thursday. This year, HELP USA awarded 30 scholarships in honor of the organization’s 30th anniversary. Governor Andrew Cuomo presented Vice President Biden with the HELP HERO Humanitarian Award. The award recognizes Vice President Biden’s outstanding service to veterans and their families, and his long record of support for survivors of domestic violence and sexual assault, including the landmark Violence Against Women’s Act of 1994 and creating the first ever White House Advisor on Violence Against Women. HELP USA also recognized four civic leaders for their public service and commitment to their communities: Michael J. Dowling, President and CEO of Northwell Health; Dr. Judith Rodin, former President of The Rockefeller Foundation; Leecia Eve, Verizon’s Vice President of State Government Affairs for New York, New Jersey and Connecticut; and Kevin M. O’Connor, President and Chief Executive Officer of Bridgehampton National Bank. “As the daughter of two extraordinary public servants who taught me that we all have an obligation to improve the lives of people in our community, I am humbled to be honored by HELP USA, an organization Verizon has been proud to support for its critical assistance to survivors of domestic violence,” said Eve. Each year the HELP USA Scholarship Fund, established in 2000, recognizes women and men who have overcome homelessness and domestic violence. Each recipient receives a $5,000 grant to support his or her educational and professional goals. Domestic Violence is now the leading cause of homelessness in New York City. HELP USA, which was founded by Andrew Cuomo 30 years ago, operates a shelter for domestic violence survivors and runs the only comprehensive support program for domestic violence survivors in East New York, a neighborhood with among the highest prevalence of domestic violence in New York City. Services include case management, housing assistance, trauma-informed childcare, and an after school program. HELP USA also provides child counseling at the Brooklyn Family Justice Center, a program run in partnership with the Mayor’s Office of Domestic Violence. HELP USA serves approximately 1,000 domestic violence survivors, including children, each year. HELP USA would like to thank the 2017 HELP USA Scholarship Award Luncheon sponsors: Northwell Health, Verizon, Bridgehampton National Bank, Greater New York Hospital Association, The Phoebe Snow Foundation, Kenneth Cole, Maria Cuomo, Estée Lauder Companies, Bloomberg Philanthropies, Walmart, Tiger Baron Foundation, BNY Mellon, Avis Richards, Henry Schein, TD Bank, 1199 SEIU United Healthcare Workers East, Bloomingdale’s, Macy’s, Brightpoint Health, Gail and Scott Cannold, Citibank, Discovery ID, Hanky Panky, Joan Hornig, New York University, Henry and Peggy Schleiff, and TED Supply. HELP USA is one of the nation’s largest homeless service providers and low-income housing developers, serving at-risk populations including families, veterans, and victims of domestic violence. HELP USA currently operates over 50 programs and residences across four states. Founded in 1986, HELP USA has served more than 400,000 men, women, and children and provides over 3,500 units of permanent and transitional housing. Learn more at www.helpusa.org.